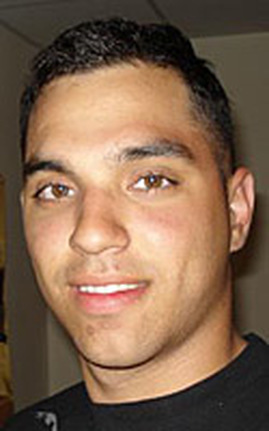 Hometown: North Bergen, New Jersey, U.S.
Died: February 21, 2010 in Operation Enduring Freedom. Army Sgt Gorra was assigned to the 2nd Battalion, 82nd Combat Aviation Brigade, 82nd Airborne Division, Fort Bragg, North Carolina as a paratrooper. He died of wounds sustained while supporting combat operations. At the age of 7, Marcos family immigrated to the United States from Cuba. His family ended up settling in North Bergen, New Jersey where he graduated in 2006 from North Bergen High School. While in high school, Marcos played football and baseball during his freshman and sophomore years but it was as a junior that he began giving serious consideration about joining the Army. In August 2006, he fulfilled that dream. This was his first deployment to Afghanistan and was due to leave the military in approximately eight months. Marcos had a great sense of humor and love for his family. He wore his feelings on his skin – across his chest was a tattoo entitled "Follow Your Bliss" and tattoos of an American flag and eagle on his arm proclaimed his patriotism to this country. He had dual citizenship and also had a tattoo of a Cuban flag. Marcos had made plans to become a New Jersey State Trooper when he left the military.